4. Machon Chaya Mushka occupies its own building on the School #144 campus, enrolling 84 girls. Approximately one-third of the girls are from Chabad families, almost all of whom are Israelis, said Yael Borgen, an Israeli teacher supported by the Israeli government through the Heftzibah program. Another 20 percent are girls who live in the girls’ residential facility (see below) supported by Rabbi Kaminezki, and the remaining 50 percent are girls from local families. Asked about the appeal of the machon to local families whose relationship to Chabad lacked depth, Mrs. Borgen responded that parents were attracted by the small classes that seldom exceeded twelve girls and by the overall family atmosphere of the school. The school day begins at 8:00 a.m. and ends at 4:00 p.m., said Mrs. Borgen, acknowledging that its length was difficult for some of the girls. Additionally, a shorter day is scheduled for Sundays. Approximately one-half of the day is devoted to Jewish subjects (taught mainly in Hebrew) and one-half to secular subjects. The secular curriculum is geared toward the Israeli bagrut examinations, Mrs. Borgen said, and the school also offers instruction in music, dance, gymnastics, and art. 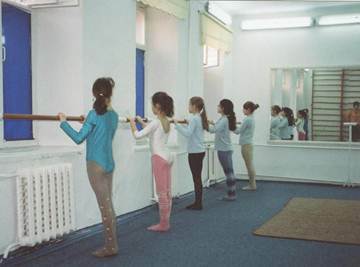 A group of machon girls begins their ballet class in a small exercise room in the machon building. They are wearing the tights that they wear with school uniforms and the three in the rear are wearing school uniform blouses. None is wearing ballet slippers or other footwear. It is school policy, said Mrs. Borgen, that all girls from the general Jewish population pay no tuition for enrollment in the machon. However, Chabad families pay tuition on a sliding scale adjusted to family means. All girls pay for their textbooks, both secular and religious, she said. The machon premises are separate from the rest of School #144. Girls have their own classrooms, computer facilities, exercise room, and dining room in their own building located in back of the main school building. However, Mrs. Borgen observed, as the enrollment of the machon grows, it is increasingly difficult to find appropriate space for all classes in this discrete structure. Some classes now are held in a room designated for teacher preparation and staff meetings. Girls from the machon rarely interact with other pupils on the School #144 campus. Rabbi Meir Stambler, Executive Director of the Chabad Federation of Jewish Communities of Ukraine, told the writer in a later meeting that a new Dnipropetrovsk campus for girls’ and women’s education now in the advanced planning stage would include a residential high school for girls from Chabad families throughout Ukraine. Presumably, girls from Chabad families in Dnipropetrovsk would attend the school as day students. The new school might include girls as young as nine or ten, and it could open as early as September 2012. Under such circumstances, the building on the School #144 campus now used as a machon might be converted into a Chabad early childhood education center, perhaps enrolling girls from nursery school through grade four. 5. The yeshiva katana (junior yeshiva) currently enrolls 84 boys officially and another three who are not listed on official school records. The other three are the sons of a rabbi from another Ukrainian city; because the yeshiva officially is part of School #144, a Dnipropetrovsk public school, youngsters who live outside Dnipropetrovsk lack authorization to attend it. According to an administrator, more than 50 of the boys are from Chabad families (the majority from Israel) now working in Dnipropetrovsk. Another 22 youngsters reside in the boys’ home sponsored by Rabbi Kaminezki, and the remaining boys are from newly religious families in the city. The school day begins at 8:00 a.m. and ends at 4:00 p.m. for younger boys. The curriculum is split more-or-less equally between religious subjects (taught in the morn-ing, mainly by Israelis) and secular subjects (taught in the afternoon). However, some secular subjects, such as computer studies, are taught very superficially. Older boys remain at the school until 5:30 for supervised homework and extra-curricular activities. Very little homework is assigned in religious subjects. Although no public announcement has been made about a change of venue, it is anticipated that a separate yeshiva katana facility will be opened within the next several years for boys from Chabad families. In common with the probable new machon for girls identified above, the new yeshiva katana is likely to be a residential school for Chabad youngsters from throughout Ukraine. (Many boys from Chabad families currently attend Chabad high schools in Israel.) At the time of the writer’s visit, no site had yet been identified for such an institution. 6. 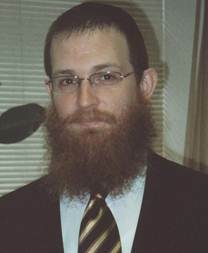 Rabbi Yossi Glick, supervises several children’s programs in the city, including residential facilities for Jewish youngsters from troubled homes. Few of the children are orphans in a legal sense; referred to as “social orphans”, the overwhelming majority are from single-parent homes in which the custodial parent is unable to provide adequate childcare due to alcohol or drug addiction, impoverishment, or other problems. Some parents are imprisoned. A few youngsters had been cared for by grandparents unable to cope with the needs of active, growing children. Rabbi Glick reported that the number of youngsters living in the two facilities remains stable after a significant decline in the past several years; the current census, he said, is 22 boys between the ages of six and 17 at the boys’ home (a former synagogue) and 16 girls between the ages of five and 17 at the girl’s home (a former large private home). In the past, the boys’ residence had accommodated as many as 40 boys and the girls’ residence had a peak enrollment of 28 girls. The decline in census is attributed to overall Jewish population decline and to “competition” from relatively new similar facilities for Jewish youngsters in nearby Zaporizhya and Krivoy Rog. All youngsters in the two residential facilities are enrolled in the yeshiva katana or machon, said Rabbi Glick. Three yeshiva students studying abroad serve as interim dorm counselors in the boys’ home, and a family resides in the girls’ home, which also is served by several local counselors. Recreational activities at the two homes have been reduced somewhat, noted Rabbi Glick, reflecting both financial constraints and the realization that youngsters were overly busy with little time to relax or study. However, boys and girls are taken on excursions and have recreational opportunities within their residences. Youngsters are rewarded with points for good behavior in the dormitories and for achievement at school, Rabbi Glick responded to a question about allowances. The points may be exchanged for various approved items at an internal store, he continued. Previous experience with cash allowances, explained Rabbi Glick, led to outside purchases of cigarettes and beer – and accompanying problems related to these pro-ducts. A native of Australia, Rabbi Yossi Glick manages several Chabad children’s programs in Dni-propetrovsk. Although youngsters in the two residential facilities frequently returned to their own homes during vacation periods in the past, the number and length of homestays has been significantly reduced in recent years, Rabbi Glick stated. Even a short weekend stay can lead to regressive behavior back at the residential program as children react to the destructive lives led by family members and neighbors, he continued. Instead, children in the homes are taken to various resorts in the Crimea, along the Dnipr River, and in other areas during vacation periods. Although Chabad has struggled for years with the rather unappealing premises occupied by the boys, no serious further renovation is planned for the former synagogue, said Rabbi Glick. However, he continued, the roof area of the girls’ home is being enclosed and will become a full apartment for the supervising family in residence. It will include a full bathroom and kitchen, said Rabbi Glick, unlike the current arrangements that force the family to share bathroom and kitchen facilities with the girls. With such private accommodations, the program should be able to attract a residential family on a long-term basis. In response to a question concerning the future plans of youngsters after they complete the yeshiva katana or machon, Rabbi Glick said that providing direction to further education for these young people after they complete high school was the “biggest problem” that he faced. Many of the girls, he observed, go on to a Chabad women’s college in Moscow or join relatives in Israel. The boys, stated Rabbi Glick, attend yeshivas in New York or France or go to Israel on their own. For a report on the interview with Rabbi Meir Stambler, see pages 24-26.